Tivoli Couture original Award Winning Plush Reversible Stroller Liners for Comfy Rides and Happy Tushies. Dress up and protect your stroller from spills, crumbs and other unmentionables. Whether your precious cargo rides in a new Bugaboo, Uppa Baby, Peg Pereggo, Maclaren, Baby Jogger, Valco or any other stroller, give her a clean and comfortable environment to ride in. Not only are Tivoli Couture stroller seat liners the choice for new strollers, but they are also an ideal pick for hand me down or gender neutral strollers. Nor compatible with Bob strollers. 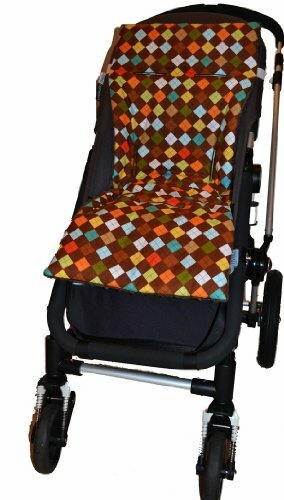 Prolong the life of your stroller with our machine washable stroller insert. If you are in the market for stroller liners or stroller pads, go with the Original and the Best. If you have any questions about this product by Tivoli Couture, contact us by completing and submitting the form below. If you are looking for a specif part number, please include it with your message.